All USB is your one-stop source for USB and flash memory information! For the most part, technology has made our lives so much easier. The sophistication that technology has undergone over the past few decades has made technology an integral element in our lives. However, there is a downside to technology when someone uses it for the wrong reasons and infringes on someone else’s privacy. Privacy is an elusive concept these days when it comes to technology; everyone knows at least one person who has fallen victim to another person who utilized technology to gain access to their private information. Luckily, technology is what it is due to its innovativeness and ability to adapt to problems that arise. Not surprisingly, new products have been designed to creatively protect one’s privacy. The myIDkey is one that’s making a buzz today. Introduced by Armaki at this year’s Consumer Electronics Show, myIDkey protects up to 16GB of your personal data and files with a biometric fingerprint scanner and an optional tap sequence function. As the guard of your passwords, myIDkey provides a secure yet highly convenient way to organize your passwords. A small OLED screen is on one side of the device; once you clear the biometric fingerprint scan, press the voice button and indicate what password you would like, the information is displayed on the OLED screen. This is highly convenient as it can store anything that you use passwords for – bank account numbers, website passwords, security PINs, etc. Another convenient element of myIDkey is its compatibility with your devices. Once it is plugged into a PC or Mac, it can fill in forms automatically with your passwords. Additionally, you can use the myIDkey with your smartphone via Bluetooth to do the same thing. Of course, since it is a small item that you will undoubtedly bring out of the house, all of the security in the world could not prevent you from losing it. Luckily, in the case that you do lose your myIDkey, there is a self-destruct feature which is activated if there are too many unsuccessful attempts in trying to access your myIDkey. Not to fear about losing the precious information that you stored there – whatever is on your myIDkey is stored in a cloud and is thus accessible even if your myIDkey is wiped out. With all of these innovative features, it’s easy to forget that the myIDkey is also a 16GB flash drive. Certainly, it goes beyond the call of duty of a simple flash drive. 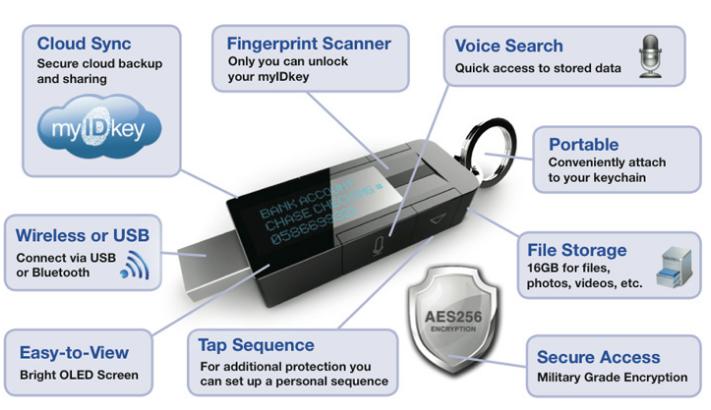 This entry was posted in myidkey and tagged AES 256, Biometric USB Drive, Encrypted USB Drives, Fingerprint Scanner, myIDkey, secure USB flash drive. Bookmark the permalink.